BEAR, DE - Bear Retro Fitness has selected the Muscle Movement Foundation as the beneficiary of their 3rd Annual Retro Fitness Run for the Heroes 5k walk/run. We are honored to announce the proceeds from this 5k will help provide life-changing accommodations to families who are affected by neuromuscular disease; such as, ALS, muscular dystrophy, and muscular atrophy. Event T-Shirt (first 200 registrants). FREE VIP Month at Bear Retro Fitness. 2 beer tickets (participants 21 years of age and older). Access to the after party (guests who are not registered can join the fun for $10). This event is being hosted by Retro Fitness (Bear, DE) and the Muscle Movement Foundation has been selected as the beneficiary of the event. If you have any questions about the event, please feel free to contact the managers of Bear Retro Fitness, Derek Marshallsea and Lesley Frost, at 302-276-0828. Click here to download and print the event flyer! WILMINGTON, DE - Rob DeMasi founded the Muscle Movement Foundation (MMF) in 2012 after enduring the physical, financial, and emotional hardships attributable to neuromuscular disease. Misdiagnosed with anxiety and depression for 3.5 years, it wasn’t until he lost his ability to walk, talk, swallow, and breathe that he finally received a proper diagnosis of myasthenia gravis (MG) in 2009. 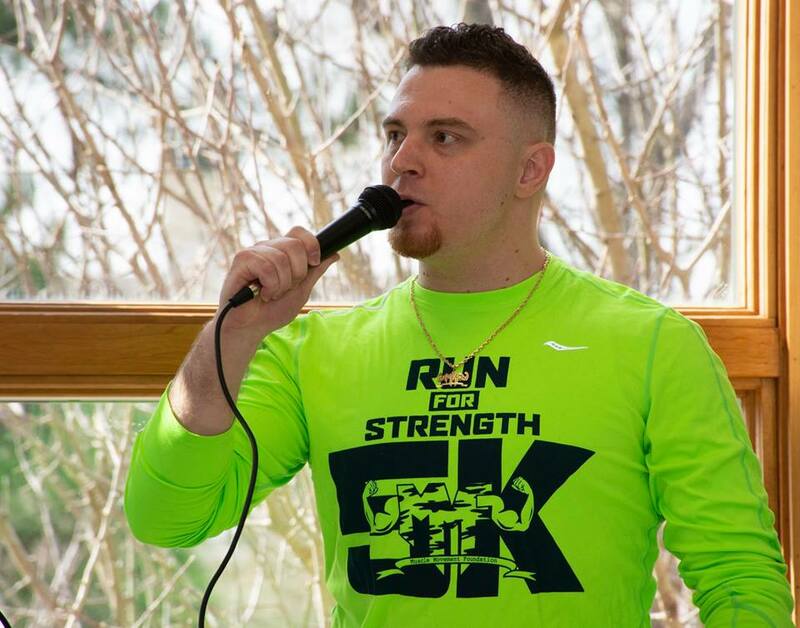 Exactly 10 years later, DeMasi brought the Muscle Movement Foundation’s Delaware Run for Strength 5k to the campus of his alma mater, Saint Mark’s High School — where he endured some of the weakest times of his life. MMF Founder, Rob DeMasi, addresses supporters at the 3rd Annual MMF Delaware Run for Strength 5k. This past Saturday, DeMasi’s vision of uniting communities across his home state of Delaware came to life. Over 700 individuals teamed together with local families who are affected by muscle disease at the 3rd Annual Muscle Movement Fdn. Delaware Run for Strength 5k! 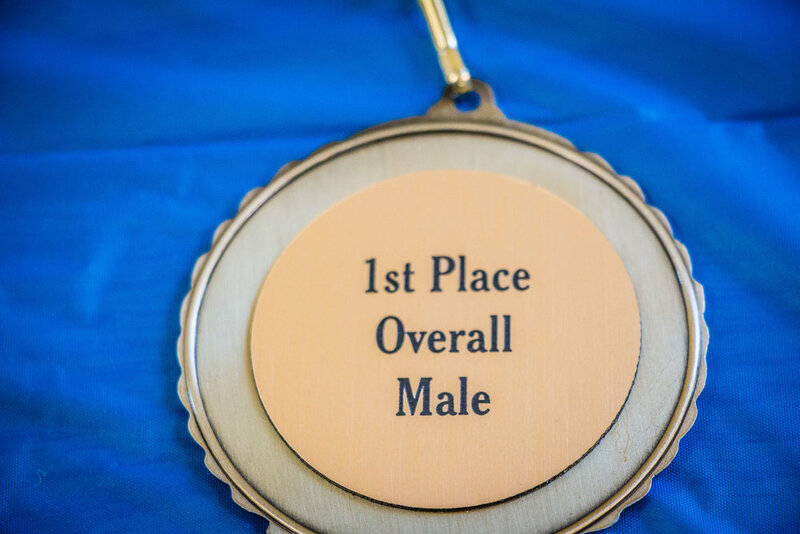 This event is an inclusive 5k walk, or run, that features an awards ceremony inside the school. It provides the opportunity for the Muscle Movement Foundation’s Muscle Champions, and their loved ones, to cross the finish line together. Muscle Champions are individuals who are living with muscle disease and champion the MMF Message. They choose to defy the odds against muscle disease and inspire others to do the same. Hundreds of participants used their muscles to fight muscle disease on 3/9/19 at Saint Mark’s High School. The event was sponsored by over 60 local business sponsors including the following businesses who were Champion Level Sponsors: Alfred I duPont Hospital for Children, Wilmington University, BioTek reMEDys, ATI Foundation, and Saint Mark’s High School. Hundreds of participants walked, ran, and powered their way through the 5k course, which started in the front of the school, proceeded down the main drive of Saint Mark’s High School, and into the neighborhood across the street from the main entrance. Many of MMF’s Muscle Champions were able to complete the 5k course by the power of their individual teams. Muscle Champions utilized adaptive running chairs and their loved ones pushed them throughout the course to cross the finish line together! MMF Muscle Champion, Reid Lo Sapio, participating in the 5k by way of the strength of his team. 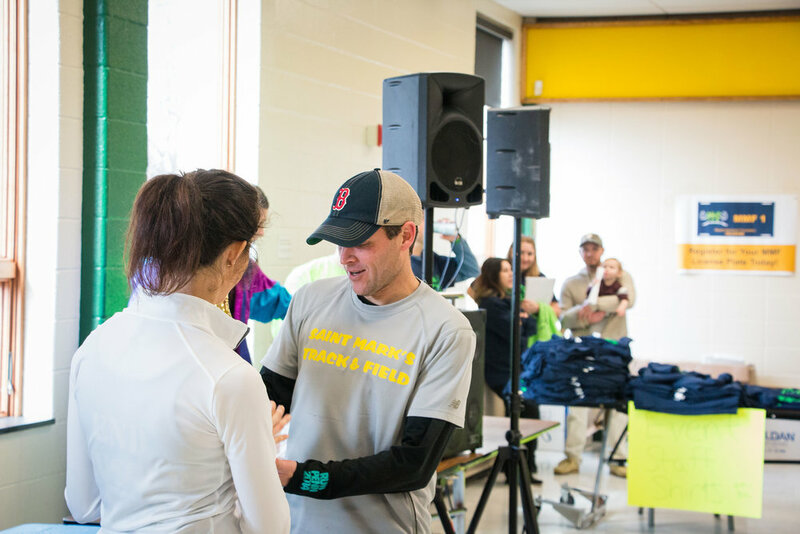 The participants were led by Michael DiGennaro, the head cross country coach at Saint Mark’s High School, who exemplified exceptional strength and stamina throughout the race. DiGennaro has been a valued supporter of the MMF for several years; implementing annual MMF Community Service Projects with his track and cross country teams. DiGennaro was first to cross the finish line in 15:55 and claimed his second consecutive MMF Delaware Run for Strength 5k gold medal! Sean Banko and Patrick Hally also earned impressive times — Banko finished in 16:58 earning Overall Runner-Up, and Hally finished in 17:24 earning Overall Second Runner-Up. Furthermore, Steve Sinko finished in 9th place overall while crossing the finish line with MMF Muscle Champion, Roman Graham, in an adaptive running chair! Sinko finished the 5k course in 18:35! Click here to see all results. Michael DiGennaro (middle) leads the race participants and strides towards a record-breaking finish. After the participants crossed the finish line they made their way inside of Saint Mark’s High School to enjoy the awards ceremony! Participants enjoyed bidding on raffle items, delicious food, drinks, and refreshments, and music produced by way of DJ Tony D! After all of the participants were replenished and rehydrated, the awards ceremony started. The awards ceremony was sponsored by way of Champion Trophies, Inc. 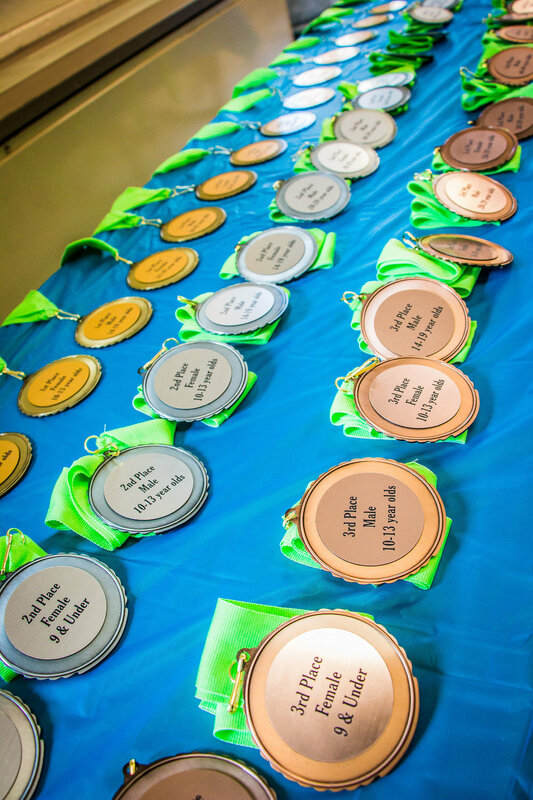 The top 3 place winners in the following age categories received a Champion Medal by way of MMF National Ambassador, Rachel Engler: 9 & Under, 10-13, 14-19, 20-29, 30-39, 40-49, 50-59, 60-69, and 70+. Rachel was the guest speaker at the 2nd Annual MMF Delaware Run for Strength 5k, currently serves as the MMF’s National Ambassador in the state of Virginia, is a nurse anesthetist, a member of our U.S. Navy, an ex-NFL Cheerleader, and is living with and defying the odds against myasthenia gravis (MG)! Hundreds of participants enjoyed an after party with food, drinks, refreshments, raffles, and a live DJ! 1.) Michael DiGennaro crossed the finish in 15:55 claiming his second consecutive MMF Delaware Run for Strength 5k Champion Title! Michael received the Overall Male Champion Medal and the MMF Run for Strength 5k Joseph Williams Overall Champion Trophy. 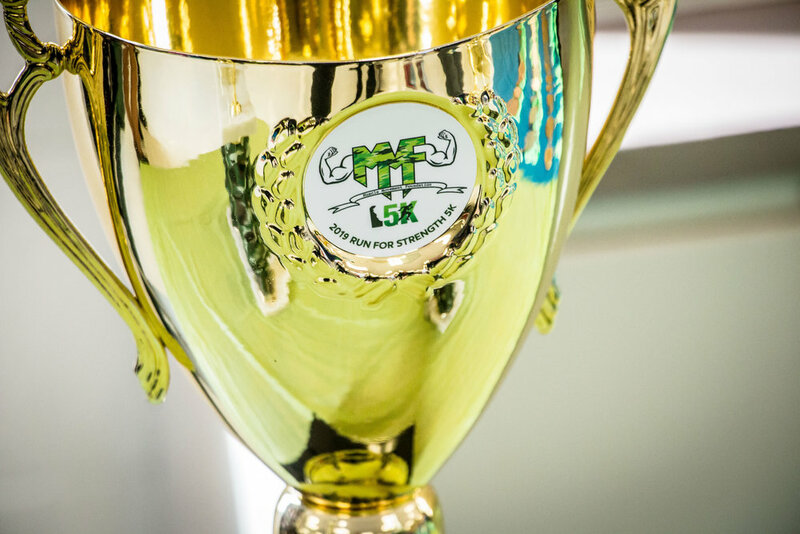 Sponsored by way of Champions Trophies, Inc., this trophy was designed in honor of the life of Muscle Champion, Joseph “Joeski” Williams. Joseph Williams, better known to his family as “Joe” or “Joey”, and to his friends as, “Joeski”, passed away from the effects of Friedrich’s Ataxia on October 31, 2013 at the age of 30. Michael DiGennaro was crowned the 5k Overall Champion for the second consecutive year. Friedrich’s Ataxia (FA) is a specific form of muscle disease categorized as a mitochondrial disease. In mitochondrial diseases, components that create energy for a cell become defective. FA is a neuromuscular disease that causes muscle weakness and loss of balance/coordination, which mainly affects the nervous system and the heart. The specific genetic mutation occurs in a gene for a protein called frataxin. The disease is hereditary, which means it is inherited in a family. About 1 in every 50,000 individuals are affected by FA. Joey was born and raised in Williamstown, New Jersey. He started out life as a normal infant, toddler and young boy. At the age of eleven, he was diagnosed with Friedrich’s Ataxia and by age sixteen, he was in a wheelchair. Despite the prognosis of FA, Joey never gave up his hope for a cure. Muscle Champion, Joseph Williams, was a sports fanatic. He loved Philadelphia sports teams! Joey was an avid sports fan and attended almost every home Philadelphia Phillies and Eagles game and was also present at many Philadelphia 76ers and Flyers games. Joey never sat home and felt sorry for himself. He was always on the go and enjoyed planning where he was going to go next. When there was a home Eagles game, Joey was up at the crack of dawn ready to tailgate before the game. The highlight of his sporting days was attending the World Series in 2008 when the Philadelphia Phillies were crowned World Champions! Joey had an amazing family that adored him and was always there for him. He had wonderful friends that supported him and included him in all of their activities, where Joey was often the one planning the activities. Joey traveled to South America, Mexico, took several cruises, and traveled to many places in the United States. Even when Joey’s health deteriorated, he pressed on and never lost his sense of humor. Joey always had something funny to say and whenever Joey was around, there was always laughter in the room. Muscle Champion, Joseph Williams, was the life of the party! Joey received a black Labradoodle service dog named Amigo. Amigo was not only Joey’s service dog but his companion and best friend. Amigo went everywhere Joey went. If Joey was hospitalized, Amigo was right by his side in the hospital room or in the bed with him. Joey and Amigo had a very special bond and were inseparable. The one word that was often used when describing Joey was “amazing” and he was always referred to as an inspiration. Joey inspired many people in his determination to live life to his fullest ability. He accepted his disease but never gave up hope that he would walk again. It was evident how much Joey was loved by the 500 plus people that attended his funeral services. Joey touched many lives and enriched the lives of all who knew him. Joey will be greatly missed. We should all take lessons from Joey to accept the circumstances in life that we cannot control and to choose to create life around all the positive things that are in our control. 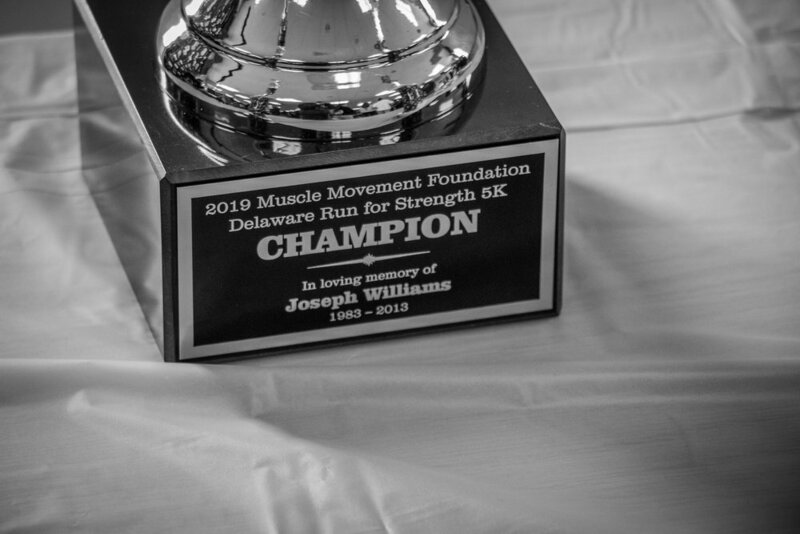 The 3rd Annual MMF Delaware Run for Strength 5k Overall Champion Trophy was designed in loving memory of Joseph Williams (March 13, 1983 – October 31, 2013). 2.) Leah-Kate Lounsbury crossed the finish line in 18:49 and claimed the Overall Female Gold Medal. She also finished in 11th place overall. 3.) The Saint Mark’s High School Track and Cross Country team received the champion trophy for the largest track/xc team in attendance. 4.) 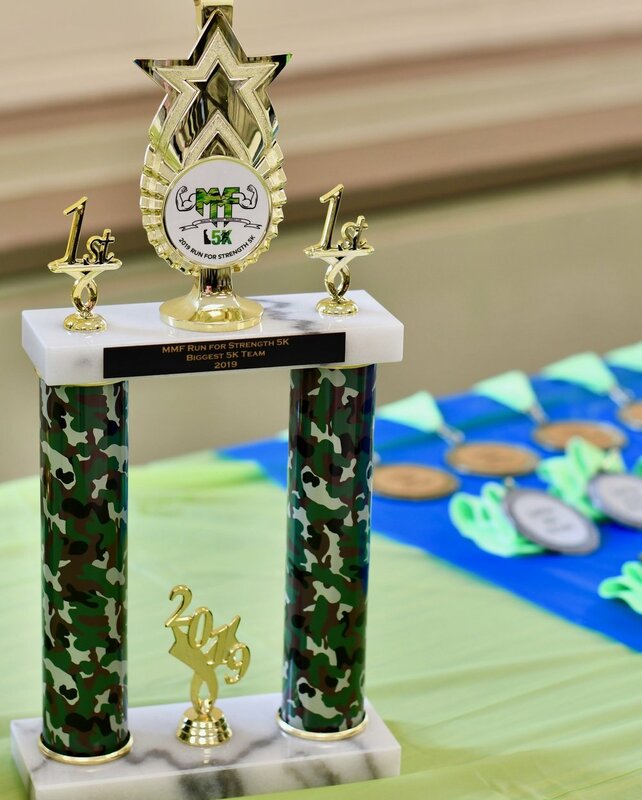 Saint Mark’s High School was awarded the overall team trophy for rallying the biggest 5k team. The Saint Mark’s Spartans united 74 members on their team. MMF Muscle Champion and National Ambassador, Rachel Engler, presenting the MMF Joseph Williams Champion Trophy to Michael DiGennaro. 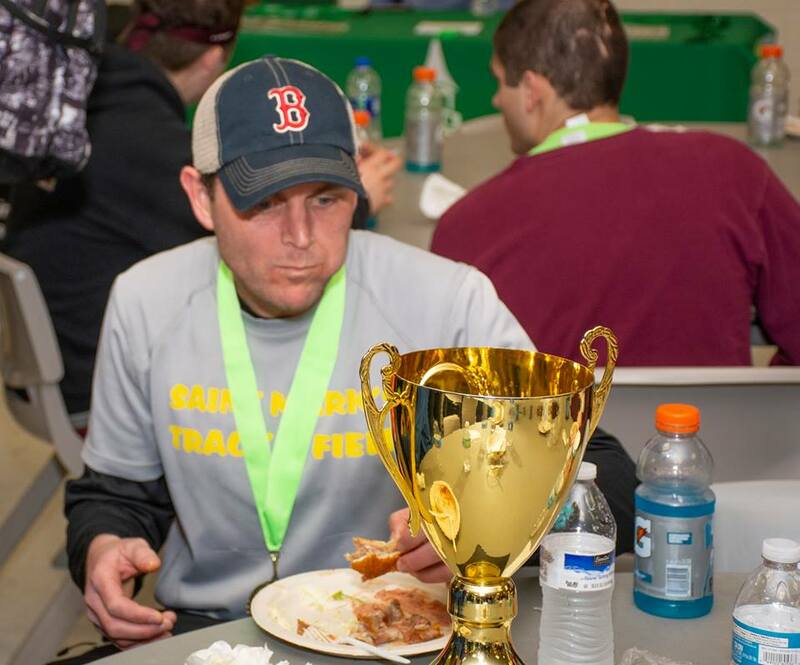 3rd Annual MMF Delaware Run for Strength 5k Champion, Michael DiGennaro, refuels while admiring the MMF Joseph Williams Champion Trophy. 3rd Annual MMF Delaware Run for Strength 5k Champion, Michael DiGennaro, with the Philadelphia Soulmates who volunteer at our event. 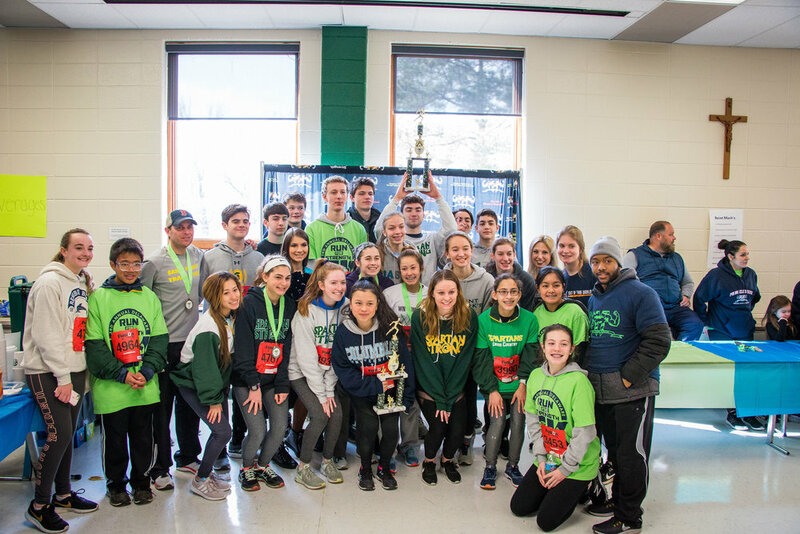 Biggest 5k team trophy via Champion Trophies, Inc.
Saint Mark’s Spartans Track/XC Team won the biggest track/xc team trophy for rallying the largest track/xc team at the event. After the awards ceremony, the participants had a special opportunity to meet 2019-2020 MMF National Ambassador, who represents The First State, Anne Marie Wilkinson. MMF Muscle Champion, Anne Marie Wilkinson, shared her testimony in living with Charcot-Marie-Tooth Disease (CMT). CMT is a disease categorized as a peripheral nerve disease. Peripheral nerve diseases cause altered sensations and movement. The sensory and motor nerves that connect the brain and spinal cord to the rest of the body are affected. This causes altered sensations, atrophy, contractures, and sometimes scoliosis. The disease affects 1 out of every 2,500 individuals and is also known as the most common inherited nerve disease. MMF Muscle Champion, Anne Marie Wilkinson, shares her powerful testimony with hundreds of attendees. Anne Marie made the decision to defy all odds in living with CMT. She continues to live a healthy lifestyle, teaches, travels the world, is an active member in the neuromuscular community, and is a graduate student at the University of Delaware. She is the true definition of a Muscle Movement Fdn. Muscle Champion! After Anne Marie received a standing ovation following her story, David Deal of Big D’s BBQ and Deli and Pastor Ray Seemans of Troubadour Ministry presented a special donation to the MMF in front of MMF’s supporters! David Deal and Pastor Ray collectively worked to donate a power wheelchair to the MMF to enhance the strength and quality of life of a MMF Muscle Champion in need. A power wheelchair may serve as just one of the many alarming expenses that are attributable to living with muscle disease. Power wheelchairs may cost more than $10,000, which many insurance companies will not cover. MMF is thrilled to be able to change the life of a family in need, by way of David Deal and Pastor Ray Seemans’ donation. Learn more about ways to give to MMF. Click here! David Deal (left) and Pastor Ray Seemans (right) donate a power wheelchair to the MMF. Several families in the MMF Community helped present the total amount of contributions raised at the MMF Delaware Run for Strength 5k. Muscle Champions, Anne Marie Wilkinson, Roman Graham, Arun Singh, Reid and Mikey Lo Sapio, Natalie Dell’Oso, and Michael Smith held up the signs to display the total amount raised at this event! 1.) Roman Graham - Roman is living with hypotonia. Hypotonia means low muscle tone. Roman was diagnosed with hypotonia at birth. Roman Graham joined the Muscle Movement Foundation in 2017. MMF has supported Roman with financial support to assist with genetic testing. 2.) Arun Singh - Arun is living with duchenne muscular dystrophy (DMD). DMD is a genetic disease that causes muscle degeneration and weakness in the body. DMD is inherited in an x-linked recessive pattern, which explains why the majority of individuals who are living with DMD are males. Statistically, individuals living with the disease lose their ability to walk between the ages of 8-18, depending upon the progression of the disease. Unfortunately, DMD keeps research centers at hold. The disease has no cure and is 100% fatal. Arun is a student at St. George’s Technical High School. He has successfully transitioned into a power wheelchair to sustain his autonomy and quality of life. Arun joined the MMF in 2018 attending our 2018 MMF Delaware Run for Strength 5k and serving as St. George’s Football Team’s Muscle Champion and Honorary Captain. He continues to raise awareness for MMF and inspire his fellow Muscle Champions to defy the odds in living with muscle disease. 3.) Reid and Mikey Lo Sapio - Reid and Mikey are also living with duchenne muscular dystrophy (DMD). DMD is a genetic disease that causes muscle degeneration and weakness throughout the body. Reid and Mikey are both involved in clinical trials and are still young enough to be able to walk. They have seen significant progress since becoming involved in clinical trials and remain optimistic for life-changing treatments that will prolong their life. Reid and Mikey joined the MMF in 2017 through the MMF’s Charity of Champion Program. They served as Salesianum Cross Country Team’s Muscle Champions and Honorary Captains. MMF is allocating close to $4,000 to integrate handicap accessible accommodations in the Lo Sapio’s home! 4.) Natalie Dell’Oso - Natalie is living with spinal muscular atrophy (SMA). SMA is a genetic disease that is categorized as a motor neuron disease. Motor neuron diseases cause muscles to become weak due to nerve cells progressively losing their function. SMA primarily affects the upper back, thighs, hips, and shoulders. Natalie is the President of the Muscle Movement Foundation at Charter School of Wilmington - a school club at Charter School of Wilmington that combats neuromuscular disease and provides an applied learning experience for students in a variety of educational fields. 5.) Michael Smith - Michael is living with duchenne muscular dystrophy (DMD). DMD is categorized as a muscular dystrophy. DMD is a genetic disease that causes muscle degeneration and weakness throughout the body. Michael has served as the MMF National Ambassador in The First State in 2017-2018. He has joined the Wilmington University Wildcat Baseball Team by way of the MMF’s Charity of Champions Program. MMF is raising funds to assist Michael with a wheelchair accessible automobile. Michael is also starting a MMF Club at WilmU. He will be the President of the Muscle Movement Foundation at Wilmington University next fall! Each Muscle Champion displayed one number at a time. MMF Muscle Champion, Anne Marie Wilkinson, displayed the final number, which was the number 2. By way of the Muscle Movement Foundation’s business sponsors, registrants, families, and friends, a total of $22,325 was raised at the 3rd Annual MMF Delaware Run for Strength 5k! (left to right) Muscle Champions, Anne Marie Wilkinson, Roman Graham, Arun Singh, Mikey and Reid Lo Sapio and MMF Founder Rob DeMasi and Dr. Mena Scavina from AI duPont Hospital for Children, Natalie Dell’Oso, and Michael Smith! By way of the MMF and their supporters, $22,325 was raised to provide life-changing accommodations to families who are affected by neuromuscular disease. Donations from this event will provide life-changing physical, financial, and emotional accommodations to families who are affected by neuromuscular diseases in the state of Delaware. It takes a team effort to fight muscle disease…And MMF’s Team in The First State is STRONG! 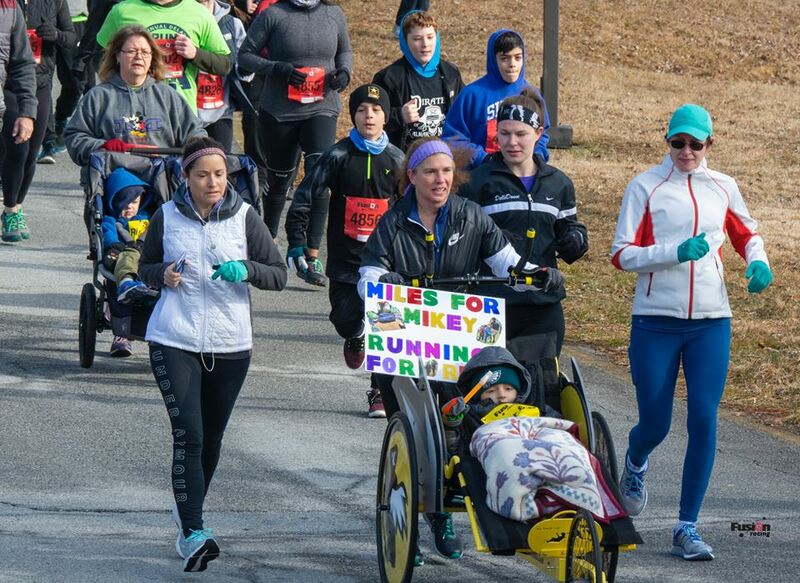 Thank you to all supporters, donors, and volunteers for making our 3rd Annual MMF Delaware Run for Strength 5k a success - So families who are affected by muscle disease can LIVE LIFE STRONGER! Would you like to continue to make an impact for MMF? 1.) 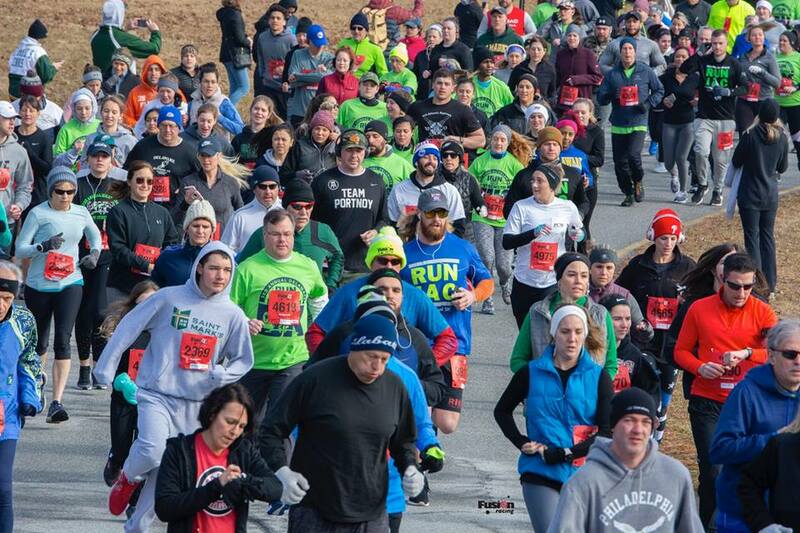 Register for the Bear Retro Fitness 5k. Bear Retro Fitness has selected the MMF as the beneficiary of their 5k on 5/19/19. Click here to learn more, register, and/or donate. Please note, by submitting a testimony you are automatically providing MMF permission to publicize your testimony.